I often find myself asking Google to save the day by finding the information that I need on a certain topic. While this can hold true in many areas of life, it’s nice to know that there is an expert in the oil industry just waiting to help answer questions regarding your equipment and lubricant needs. Shell LubeChat brings you Shell expertise 24/7, equipping you with faster, better-informed decisions that can ultimately help you run your business more efficiently and help to bring down your total cost of ownership. Whether in the field or at the office, you can access an easy to use online chat room and get the answers that you are looking for. Shell LubeChat is accessible on your mobile device as well as your desktop. Get the recommended Shell alternative if you are having issues with your current product or products. 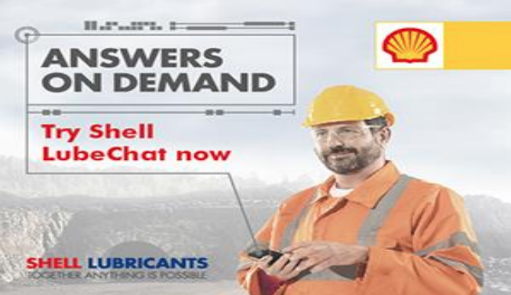 Shell LubeChat offers flexibility to get the answers you need. Find the products that are right for your equipment and access technical data sheets and safety data sheets on all Shell products. Read testimonies on how other customers have improved their operations. No matter where your business takes you, Shell LubeChat is there to help! Check it out today by clicking on the link below, then click on the chat box on the bottom left of your screen.